At first, she only did art because she had no other choice. When Miss Caline Ng, 22, had to choose which O-level subjects to take while she was in Secondary 3, she picked Art because the other option was to do Design & Technology (D&T), which she disliked. But her art teacher at Pasir Ris Crest Secondary, Ms Koh Yann Ling, saw potential in her and became an influential mentor. "I didn't know that I'd love art then. But Ms Koh really brought out (the artist) in me," said Miss Ng. "She inspired me to pursue art in my studies and as a career." Her most recent project, Inevitable, is a series of 14 post-apocalyptic photos of Singapore. 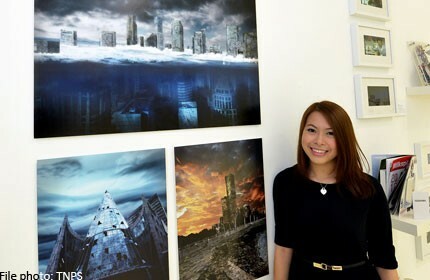 She made use of Adobe Photoshop and Illustrator to edit photographs of familiar Singaporean landmarks such as Clarke Quay, City Hall and even HDB flats in Simei, making the buildings appear to be in various stages of dilapidation and disrepair. For instance, one work depicts a post-apocalyptic Wheelock Place, with parts of its glass exterior shattered and smashed. Miss Ng first got the idea for Inevitable from predictions of an apocalypse in 2012, according to the Mayan calendar. "I wanted people to think hard about how they are living their lives right now," she said. "If they were to wake up to a Singapore like the one that I've portrayed in Inevitable, would they have wanted to live their lives differently?" She is now a graphic designer and a third-year Communications Design student at the Glasgow School of Art Singapore. But when Miss Ng first told her parents that she intended to study art after secondary school, they had reservations. They wanted her to do something related to science or mathematics, because those subjects are perceived to be "safer" options. Her father is a pastor while her mother is a hawker at a school canteen. She is the youngest of three children. Her brother is a legal consultant, while her sister is a teacher. Her parents eventually changed their minds and supported her after she proved to them that she was able to achieve the goals she set for herself and did very well for her O levels, obtaining a L1R5 score of 10. After that, she got her diploma in Visual Communication at Temasek Polytechnic. Miss Ng plans to follow in Ms Koh's footsteps and become an art teacher. She believes that the most important thing is to do what she is passionate about. This way, she will not have any regrets - which ties in with the central theme of Inevitable. She said: "I think that you need to do what you love in order to make a good living. "You never know what will happen tomorrow, so live life to the fullest." Miss Ng is in Scotland for a student exchange programme, and she misses home even though she is enjoying the weather and the scenery there. "Its beautiful here, but nothing beats home," she said.